Food and Family is centered on the Cuccurullo family of Island Bay whose first generation sons have established the Mediterranean Food Warehouse chain of retail stores that stock many of the foods their grandparents missed. At the heart of the book are recipes from the wider Cuccurullo family and their Italian friends in Island Bay. Needless to say with fishermen and fishmongers in the family there is considerable emphasis on seafood dishes – but the variety of dishes is wide, ranging from how to make fresh mozzarella to the best way to make rum baba. The book is lavishly illustrated with photographs by veteran Wellington studio and food photographer Sal Criscillo whose parents were also migrants from Italy, but from the volcanic island of Stromboli, who came up the book idea over an espresso with the Cuccurullos. 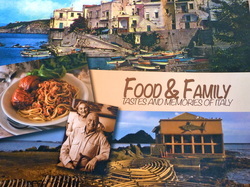 Food and Family – Tastes and Memories of Italy, is available from Mediterranean Food Warehouse outlets in Wellington, Lower Hutt and Kapiti and via their website, and from Unity Books, Willis Street, Wellington. Book costs $35.00. From left to right, Nina, my brother Gino, our mum, Teresa and my brother Joe. Photo taken at the Mediterranean Food Warehouse.